In Part 10, we are going to take a look at local user management for the VAMI interface. By default, only the root local user exists but customers have the option of creating additional accounts. In vSphere 6.5, the VAMI has been enhanced to support different roles such as Admin, Operator and SuperAdmin. You can refer to the VAMI documentation on what each of the roles provides. 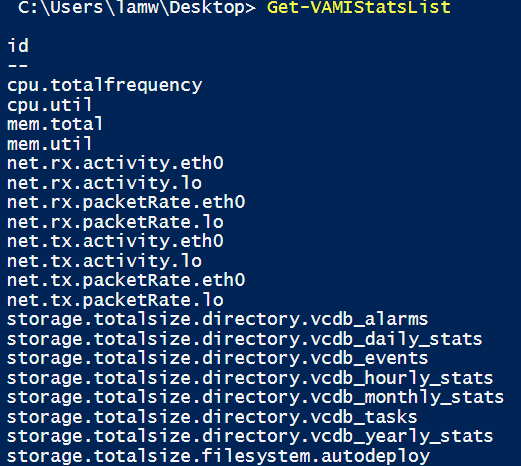 There is not a VAMI UI for user management, this is currently only available using the VAMI REST APIs. To retrieve all VAMI users, use the Get-VAMIUser function. By default, your system will probably only have the root user unless you have already added additional VAMI users. To create a new user, we will use the New-VAMIUser which requires a few input parameter that should be pretty self explanatory. The role parameter can be one of three values: admin, operator or superAdmin as defined in the VAMI documentation. 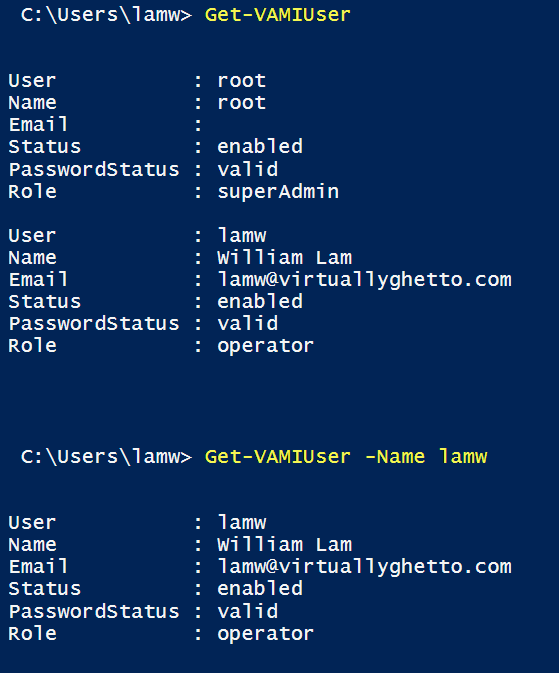 New-VAMIUser -name lamw -fullname "William Lam" -role "operator" -email "lamw@virtuallyghetto.com" -password "VMware1!" If we now re-run our Get-VAMIUser command, we should see the new user that we had just created. To remove a VAMI user, you simply use the Remove-VAMIUser and specify the name of the user you wish to remove. Below is an example of deleting the user we had just created. 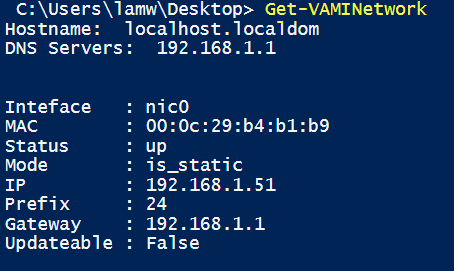 One thing to note is that when using the Connect-CisServer cmdlet to interact with the VAMI REST API, it currently does not support connecting with local VAMI users, only SSO users. 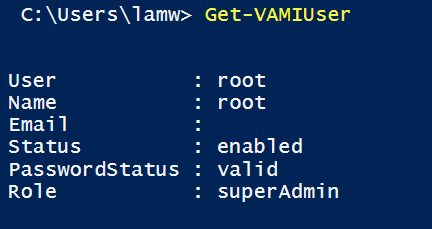 This is a limitation with the PowerCLI implementation and does not affect direct use of the VAMI REST API or using it through other SDKs. This is something that will be resolved in a future update of PowerCLI, so something to keep in mind as I was scratching my head when trying to use a local user to authenticate. In Part 9, we were initially going to cover the new backup and restore capability that was introduced in vSphere 6.5 for the VCSA. However, it looks like Brian Graf has already created an awesome PowerCLI module (Backup-VCSA.psm1) that can be used to backup the VCSA, which you can find more details here. While going through the VAMI APIs for the backup feature, I did notice there was one interesting backup VAMI API that Brian may not have looked at, at least I did not see a function consuming this API. 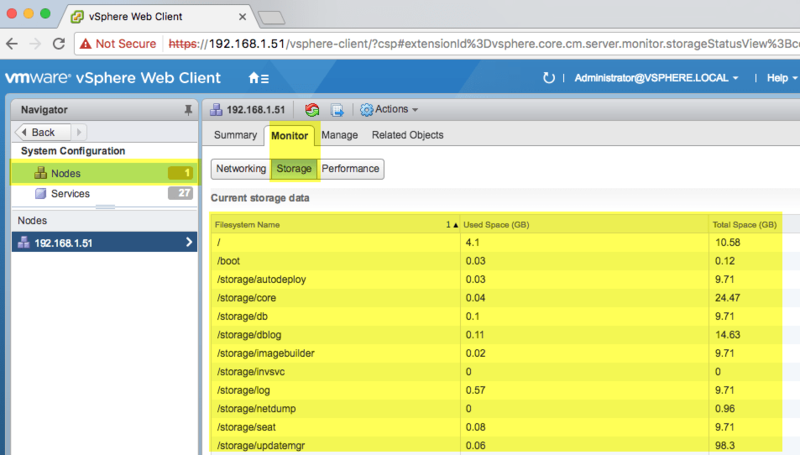 Prior to initiating a backup for either a VCSA or PSC, you can query the expected size of the backup. This information can be pretty helpful beyond just for backups, but understanding the size of your system at any point in time. The backup and restore feature for the VCSA is located in the VAMI UI, but there is not a UI for retrieving the current expected backup size. The output is pretty straight forward, it provides the total expected backup size (MB) as well as the breakdown of the total size into "configuration" data and the "Stats, Events, Alarms and Tasks" (SEAT) data. With this new API, you can now easily see how large your vCenter Server Database is and take appropriate action such as truncating the data or reducing the retention period which can especially help with the performance of vCenter Server as well as the time it takes during upgrades. 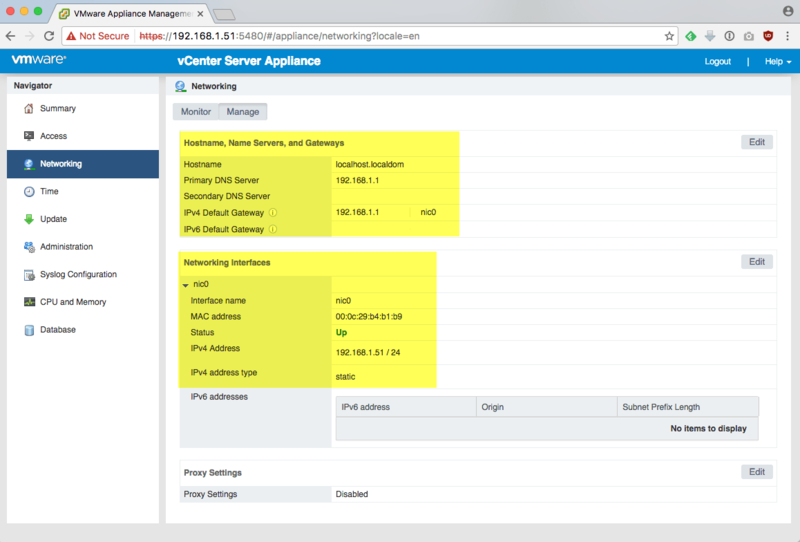 There is not a service view in the VAMI UI (https://[VCSA]:5480) for either the VCSA or PSC. 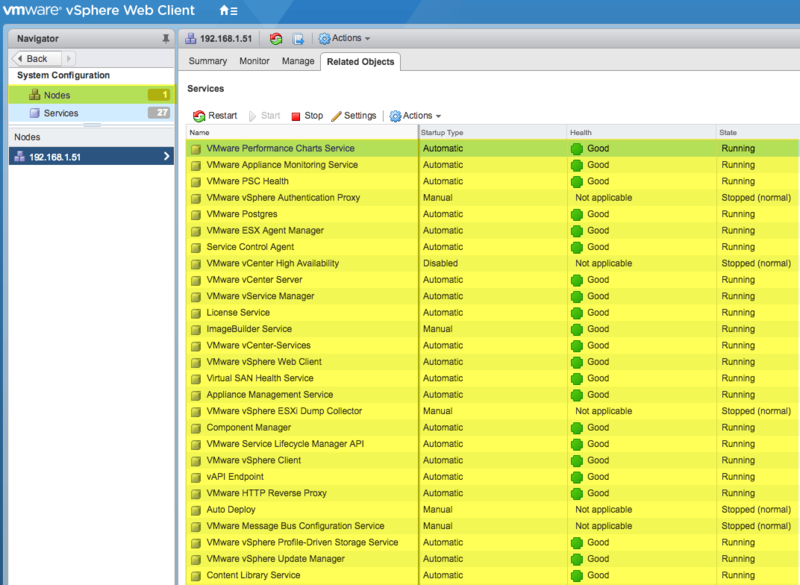 However, this information is available as part of the VAMI information when logged into the vSphere Web Client by navigating to System Configuration->Nodes->Related Objects or System Configuration->Services. The Get-VAMIService will lists all available services for the given VCSA or PSC node that you are connected to. It provides the exact same output that you would see in the vSphere Web Client such as the name of the service, the current state, the health and whether the service is disabled or configured to start up automatically or manually. We can use the Start-VAMISerivce function and given a service name, we can start it as shown in the screenshot below. Similialy, we can use the Stop-VAMISerivce function and given a service name to stop the service as shown in the screenshot below. In Part 6, we will take a look at how we can use the new VAMI APIs to easily associate the underlying VMDKs to their respective OS disk partitions for a VCSA or PSC node. In addition, the workflow of increasing the disk capacity for a specific partition has also been simplified further with the new VAMI APIs. After increasing the specific VMDK size, we can now also trigger the partition resize operation using the VAMI APIs, where as before this used to be a manual task that required SSH access. In vSphere 6.5, there have been a few minor changes to the VCSA's VMDK layout and sizes, for more details, please have a look at this blog post here. In Part 5, we are now going to have a look at networking section of the VAMI UI. In the Networking tab, under the "Manage" sub-tab, you can find details about the system Hostname (PNID), DNS servers as well as the configurations for each network interface (in the case of a VCHA deployment, you would have more than one network interface configured). This sample script only retrieves IPv4 networking information, but you can easily retrieve IPv6 information by calling into the IPv6 VAMI API endpoints which you can refer to the documentation or the API Explorer for more details.